Isla Mujeres is an island in the Caribbean Sea, located about 8 miles (13km) East off the coast of Cancun. This tiny island, only 4.3 miles long and 0.4 miles wide, is home to some of the most beautiful beaches in the Caribbean. The most famous one being Playa Norte, right on the Northern tip of the island, famous for its soft white sand and crystal clear, turquoise water. The inner side of the island, facing Cancun, is characterized by calm water, beaches and beach bars, as well as many docks and marinas, whereas the eastern side, the “wild side”, is more rocky, with a stronger surf, but also very beautiful in its own way. Legend has it, that the island was named Isla Mujeres (Island of Women), because when the Spaniards arrived at the 16th century and took control over the island, it was populated only by women, many of them priestesses serving the Mayan god Ixchel, God of fertility, medicine and joy. The whole island was a sacred place, devoted to Ixchel and its worshippers. Before the Spanish took over, the island was part of the Maya province Ekab. The Salinas (small lagoons) served as a prime source for salt, which was also used as a trading currency those days. A small Maya temple was located on the south side of the island, but Hurricane Gilbert wreaked havoc in 1988, destroying most of the temple and leaving only its foundations intact. Recently 5 more ruins of ancient Maya structures have been revealed on the island. 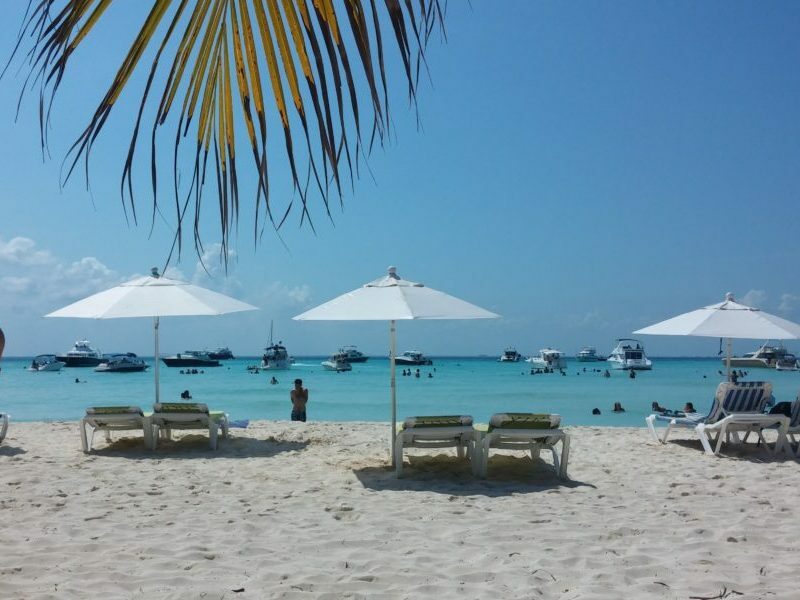 Isla Mujeres is very relaxed and easygoing. The locals are nice and there is a strong feeling of community when walking along its colorful streets. The center of town is located in the north part, near the beaches, with most restaurants, bars and souvenir shops concentrated on Hidalgo Avenue. In the evening you can find numerous bars offering live music, great reasonably priced food and plenty of tourists and long term visitors from around the world. The most popular activity is renting a golf cart and touring the island all the way towards the south point, enjoying all the island has to offer along the way. 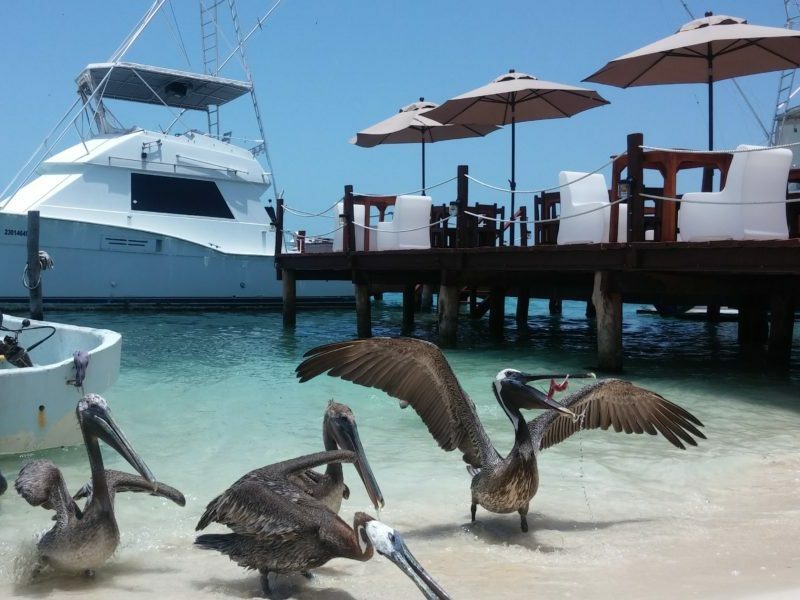 Since the 1970s, along with Cancun, the tourism industry has developed on Isla Mujeres and for the past few years it has drawn close to 1 million visitors annually. Diving in Isla is diversified and has much to offer to all types and levels of scuba divers. The water is calm and warm, with excellent visibility year round. For those looking for easy shallow diving, many of the reefs such as Manchones Reef, Bandera Reef and Tavos Reef are conveniently located at 30-40ft, where you can find huge coral formations reaching almost to the surface, large schools of Grunts, Snappers, Wrasse, Blue Tangs and more. There is a population of Sea Turtles living nearby, so it’s quite common to encounter them nibbling seaweed along the reef. In addition, you can also spot Moray Eels, Lobsters, Giant Crabs, Squid, as well as colorful Parrotfish and Angel Fish. Another magnificent sight which can be found close to Manchones Reef, is Cruz de la Bahia (Cross of the Bay) – a giant cross sunk in 1994 to pay tribute to the men and women of the sea. Speaking about sunken sculptures, one of Isla Mujeres’ most famous attractions is MUSA – the underwater museum, which consists of some 500 sculptures, placed at about 30ft deep, during 2009-2010 by British artist and conservationist Jason deCaires Taylor, as well as 5 other Mexican sculptors. 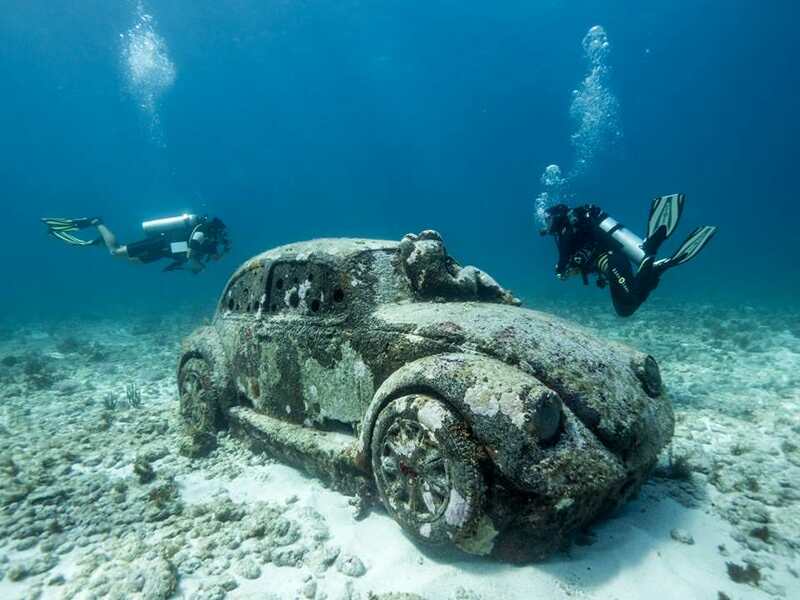 These sculptures are easily visible to snorkelers as well, but divers can explore them up close, watching how the unique PH-neutral concrete used to create them has since been covered by a thick layer of corals, sponge, seaweed and algae, forming a living eco-system which serves as a home to many diverse ocean dwellers. More advanced divers can explore Punta Sur, the southernmost point of the Island. This is a deeper drift dive, featuring a very healthy and impressive reef, thanks to the constant currents and nutrients flowing in. There are several of swimthroughs and a cave, as well as 400-year-old remains from an old ship anchor. During the months of May till July, plenty of Turtles can be spotted here, as it is their mating season. Occasionally you can even spot Dolphins playing in the area. The max depth of this dive is 40ft (12m). Cave of the Sleeping Sharks – this dive site is more distant than the rest, and was discovered by Carlos Garcia Castilla, a local fisherman. The cave contains bubbles from fresh water underground springs, which rise up, allowing sharks to keep still while breathing thanks to the constant stream of water rushing past them. Usually sharks need to move around in order to breath, but in this unique cave, they can stay perfectly still, as if they were sleeping, hence the source of the cave’s name. The cave lies at about 60 ft deep and is home to various types of sharks, most commonly Nurse Sharks, but also Bull Sharks, Black Tips and Grey Reef Sharks. For all you wreck lovers, the C-58 Navy Boat is a brilliant wreck dive. Resting at about 70 ft deep, this large vessel has been literally split into two by Hurricane Wilma in 2005, making it easily penetrable and most of its quarters accessible, guaranteeing a very interesting dive and many different areas to explore. Around the vessel you can spot large Barracudas, schools of Eagle Rays, Lobsters, large Groupers and more. This is an advanced dive, due to the strong currents in this area. Last but not least, you can’t discuss Isla Mujeres without mentioning the famous Whale Shark season. Even though you can’t Scuba dive with them, but only snorkel with them, this is a once in a lifetime experience! During June to September, Whale Sharks pass Isla Mujeres on their journey towards the open Atlantic Ocean, giving us a glimpse of their feeding habits and allowing us to witness them up close, in their natural habitat. This gentle giant, which can grow up to 40ft, is usually indifferent to the presence of snorkelers around him and during the peak season, you may witness up to 30 Whale Sharks feeding in the same spot. This is by far one of the most powerful experiences one can witness during their lifetime. 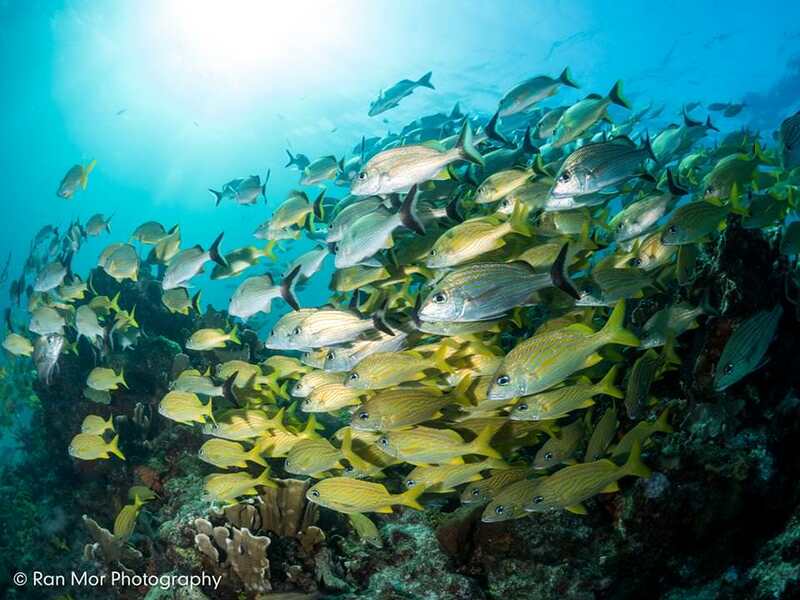 Diving in Isla Mujeres is a truly fantastic experience, offering something for everyone. We hope you can join us soon and explore the wonders of this magical island, both underwater and above!